The winter months bring outdoor enthusiasts plenty of new opportunities for recreational sports and snowshoeing is one of those activties that also offers a fantastic, affordable, low impact workout. From skiing to sledding to ice skating, cold weather facilitates a variety of fitness activities available only in the winter months and Snowshoeing is one of those activities that might be a fun new activity for your family to try together. 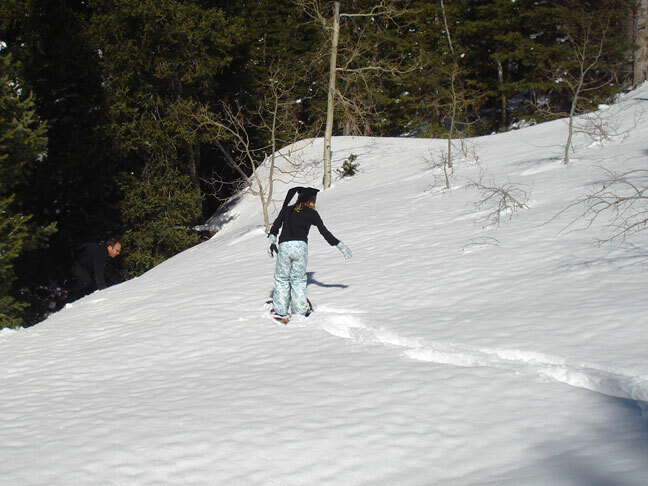 Our family tried snowshoeing last spring while vacationing in Utah. Even though I consider myself physically fit, snowshoeing was an unexpected challenge for me—one that I thoroughly enjoyed! It was a really great way to elevate the heart rate and get the kids outdoors moving in the snow, as well. The fresh mountain air and picturesque mountains were exhilarating for everyone. There really was something magical about walking through a peaceful winter wonderland and laying tracks in the serene snow. Snowshoeing is the perfect way to crosstrain while enhancing your current fitness level. Thirty minutes of steady walking in snowshoes translates to roughly a thirty minute jog on pavement. Furthermore, walking through the snow engages more muscle groups than road running, thereby switching up the motion and avoiding more common running injuries associated with repetitive movement on less forgiving surfaces. In general, there are three basic types of snowshoes, depending on your interests and goals. Additionally, larger individuals typically require larger snowshoes. Aerobic or running snowshoes are the lightest, smallest type if you intend to move your regular run to the snow or compete in races. Recreational snowshoes are larger than their aerobic counterpart and intended for moderate walking. Mountaineering snowshoes are the largest shoes, intended for long distance trekking or serious backcountry exploring. Waterproof hiking boots tend to work the best for snowshoeing, but you can use your regular running shoes. Just be prepared to endure wet feet, depending on how deep the snow is you are traversing. Dress wisely. Snowshoeing tends to kick up the snow, so your legs will get wet. It is best to dress in waterproof pants for maximum comfort. Because snowshoeing can be a high intensity workout depending on the terrain and your level of exertion, it is wise to dress in layers you can shed as you go. Poles are optional for snowshoeing, though they do offer you more stability and support if you are trekking through uneven terrain. Some people prefer poles for aiding them in climbing hills and descending into valleys, as well. You can try before you buy. Many resorts and vacation destinations offer snowshoe rentals for as little as $15 for the whole day. Conversely, you can invest in your own pair of snowshoes; they typically cost anywhere between $50 and $300, depending on the style you choose. If you are looking for an alternative to the elliptical trainer or you are tiring of running on slick winter pavement, you might consider snowshoeing. It’s a gentle, budget-friendly activity that burns anywhere between 500-1000 calories per hour, depending on your pace and body weight. It’s a great workout that allows the whole family to participate while getting back to nature.